We met Ulf Karaker during the All Square Nations Cup in Turnberry last year (find out more about the 2018 edition) where he was representing Sweden with three of his friends. As founders of All Square, we were very impressed by the passion Ulf has for the game of golf. Not only does he want to constantly improve his game but he also loves to travel the world to discover new courses with his wife Ingrid. 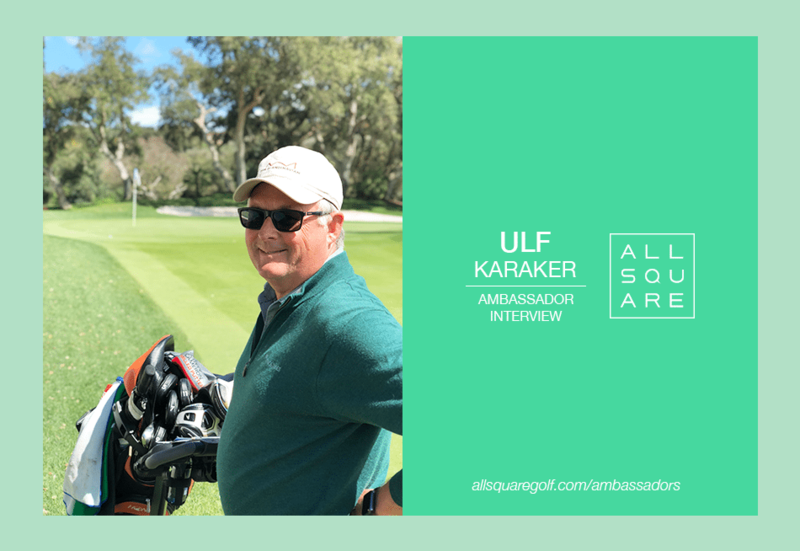 Ulf was one of the first golfers to join the All Square Ambassador Program. As such, we’re happy to start our series of ambassador interviews with Ulf who will be at The Masters in Augusta to watch Sunday’s final round! Well, it started on the driving range with my family in the mid 80’s but on a very low level. I was running a family company selling machine tools to the Scandinavian industry and our customers in Sweden pulled my leg quite a bit because I did not really play golf. I decided it was about time to start playing. I went to a pro in 1991 at Sollentuna Golf Club just outside Stockholm and to Båstads Golf Club in the south of Sweden to get my green card and take lessons from a very nice English pro, Jim Suckling. You are a member of Fågelbro Golf and Country Club and The Oitavos, can you tell us what makes these clubs so special? Both myself and my wife Ingrid have been members of Fågelbro Golf and Country Club since 1995. Fågelbro has quite a unique concept in Sweden, offering not just golf but also a very nice gym, squash hall, tennis courts, and Paddel ball facilities. The club is located close to a harbour and hotel facilities, and today Fågelbro has some of the best golf restaurants in Stockholm. The golf course is very narrow, not long, and requires plenty of accuracy. Fågelbro is around 45 min from Stockholm city center in the beautiful Stockholm Archipelago. Oitavos Dunes is one of the best golf courses in Europe and is currently ranked as the best course in Portugal on All Square. It is a very beautiful, demanding links course where the wind and the greens make it very tough to play well. It is one of the best courses to play year-round since it is hardly affected by rain at all. Oitavos Dunes is in the very nice Cascais area close to the Atlantic Ocean and just 30 min from Lisbon. So far playing Prestwick Golf Club, the birthplace of The Open in 1860. I had an amazing Caddy who not just told me how to play the hidden holes but also some extra ordinary stories about some of the members. Just entering the clubhouse gave a fantastic ”feel good” feeling taking into my golf soul some small but important part of the golf history. Walking and playing on this course was fantastic. I was introduced to All Square some years ago through our Golf Director, Frederico Champalimaud but I did not get a hook for it until I met Patrick Rahme and Arthur De Rivoire on a very nice golf trip. They explained the idea about the All Square Golf community and all the benefits. Since then I use it almost every day. I suppose since I am very active on All Square it made sense to become an Ambassador. All Square has given me golf friends and very, very good golf tips of golf courses, golf players. In addition, All Square are arranging very interesting golf trips to some places that you can just dream about. Since I live in Portugal, I do a lot of travel within the Iberian half-island. Last year I travelled between Portugal and Sweden, and also to France, Dominican Republic, Britain & Ireland and in South Africa. South Africa sticks out as golf destination but there are so many good golf courses. I am going to Augusta in a few days, so I suppose that I have to mention that course, Turnberry Isle Miami and Hammock Bay Golf Club in Naples Florida. Worth a mention in the UK is of course The Ailsa course at Turnberry, Prestwick, and Woburn in England. Continental Europe Bro Hof Slott in Sweden, West Cliffs and Monte Rei in Portugal. Old Head and the European in Ireland were also something special. Next up is the US (leaving tomorrow). We will be playing 5 courses close to Atlanta as well as attending the final day at the Masters in Augusta.